Garage door systems can be complex without the proper knowledge, and when your garage door is not working, it can quickly become frustrating and overwhelming for homeowners. When your garage door or garage door opener breaks down, the best way to get it up and running quickly is to contact a professional garage door company. Garage door problems can happen to anyone at any time. If you need garage door repair in Navarre, RTS All American Garage Doors has the professional knowledge, experience, and equipment to quickly make the necessary repairs to get your door operating properly. Whether you have broken garage door springs or cables or an off-track garage door, you can rest assured that our garage door technicians will be able to find and repair the problem. Our garage door company has years of experience servicing and repairing various makes and models of residential garage doors. Unlike other local garage door repair companies, we never want our customers to be inconvenienced by a broken garage door for long, and that’s why we offer same-day and emergency garage door services. Whatever problems you are experiencing with your garage door, you can rest assured that our team of technicians will be able to provide you with a working solution. An off-track garage door is a real inconvenience. Not only will your garage not open and close properly, but it could also potentially fall on belongings in a garage, such as a car. Not to mention, it puts your home at a security risk. Off-track garage doors can happen due to broken garage door cables or springs, or it can be due to damaged or bent garage door tracks. If your garage door has fallen off its track, it is a job that can be risky to fix on your own. Instead, contact RTS Garage Doors for the professional off-track garage door repairs that you need for a garage door system that works like new. Just like any mechanical part or component, garage door torsion springs will wear over time due to using the system just about every day. These springs are designed to balance the weight of the garage door so that it can open and close smoothly. When you are left with broken garage door springs, it is best to contact our professional garage door company to make the needed repairs and replacements in order to get your door working properly. If your garage door is not opening the way it should, the issue may not necessarily be with the garage door, but instead with the garage door opener. Homeowners often experience issues where their garage door will not open or close, will only open partially, or will reverse before closing completely. Even a minor issue with the garage door opener can cause the entire system to malfunction, so it is best to rely on a professional to perform a garage door inspection to find the issue at hand and make the proper fixes. 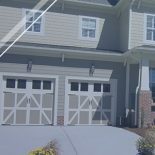 When you are looking for garage door repair in Navarre, FL you can count on RTS all American Garage Doors. To learn more about our garage door services or to receive an estimate, contact RTS All American Garage Doors today!